Tractors were secured to flat cars in various configurations, depending upon the size of the tractor. The 1944 AAR tie down instructions separates by weight. The 1952 AAR instructions do not. Small tractors are loaded crosswise, if short enough. Tractors are also loaded lengthwise (side by side) or at a diagonal. Extremely large tractors, ie today’s behemoths, are loaded end to end, sometimes only two per flatcar. The idea was to get as many units per flatcar, without exceeding the weight limit of the car or exceeding the clearance limits. 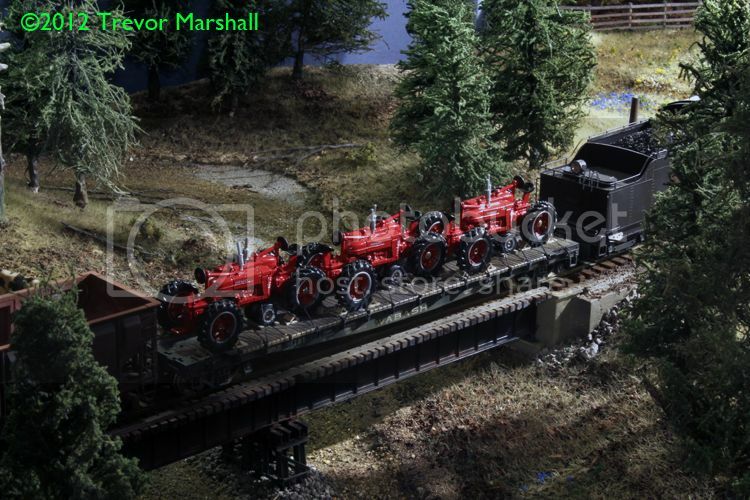 I have photos showing as many as 10 units per flatcar. Thanks, Doug, for the additional information! This entry was posted in equipment, Other freight cars, prototype influence by Trevor. Bookmark the permalink.